Hello, everyone! Happy Friday! I hope you all had a great week! I was in New York City yesterday with the nugget and my baby daddy :-P. It was a long day, but a good one. At first my poor little nugget was crying to come home. He was feeling very overwhelmed as we just live in a small Pennsylvania town with nowhere near the hustle and bustle of a sprawling metropolis. He kind of snapped in Madame Tussaud’s, crying and threatening to scream. After a little while he warmed up to it. We went to Trump Tower (NOT my idea, definitely not a fan), Dylan’s Candy Bar (they had Color Club smiley face glitter! ), the Lego store, Barnes & Noble (could’ve spent the day in there- it was huge! ), a comic book store called Forbidden Planet, and Halloween Adventure, a store filled with anything you could possibly want to put a costume together, which is open all year round and takes up a block! After we got on the bus, my little guy passed out within 5 minutes and didn’t wake up until we got home. And my feet didn’t get rubbed raw with all the walking, which is a huge plus in my book! To the polish! This is a polish I received as a Press Sample from Octopus Party Nail Lacquer some time ago. This dusty pink holo was part of one of Dave’s spring lines….possibly 2 years ago. I’m iffy with my time lines. All OPNL formulae are superb, this one being no exception. All polishes are very high quality! For this, I did 3 coats to achieve opacity and finished it with a top coat. As for the embellishments- I actually put this color on just to use them. I’m in a lovely little nail group called 2 Polish or not 2 Polish. In it is a member who has a nail art business who offered to send samples to a bunch of us in the group to try- no strings attached. She had sent me the flower and a variety of different colored Swarovskis, of which I picked out the pinks to accent the polish. I added another coat of top coat and applied all said embellishments. If you’d like to check out her business, it’s at www.nailartelegance.com. She has a variety of studs, rhinestones, charms, etc. all at a very affordable price. Hope you all like my blast from the fairly recent past! Have a great weekend and thanks for stopping in! I really like this shade of pink. I adore a good delicate polish. Very pretty shade and I adore the flower charm. I need to try this brand! Such lovely polish. He really does make amazing polishes. I haven’t had a bad one and I swatched for him since his first spring release a few years ago. He just keeps getting better! 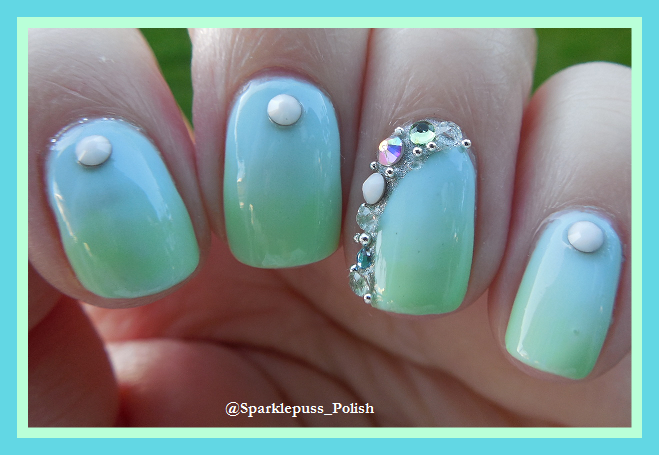 I love the big charm accent nail!